Let's learn more about The Franklin Institute, the premier science museum in Philadelphia, and its stunning exhibits for visitors of all ages. Of course, you can get the most up-to-date information, on the latest exhibits and other features, by visiting the official Franklin Institute web site. 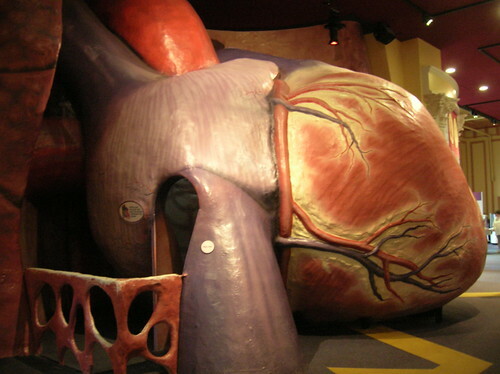 The Giant Walk-Through Heart is undoubtedly the museum's most famous exhibit, and has been for over half a century. It really has to be directly experienced to be believed, and it is a cherished experience for generations of Philadelphians. The Heart is so gargantuan, that it would be perfectly suited for a person who is 220 feet tall. Given its colossal size, The Heart required four tons of plaster and papier mache to construct. Ironically, in light of its eternal popularity with visitors, The Heart was originally intended, as only a temporary exhibit, for six months!. It has now lasted over 55 years. Just over two decades after the science museum moved to 20th and the Parkway, in 1934, The Heart opened to the public on January 29, 1954. The Heart had been constructed in 1953, and the museum duly celebrated its 50th birthday in 2003. In 2004, it closed for six months, for renovations. The need for renovations came from the fact that The Heart had been made originally of only temporary materials, as it had been envisioned as only a six-month exhibit. It was originally constructed in 1953 for $40,000 - about $319,000 in today's dollars. Although $40,000 was a considerable amount of money back in 1953, it undoubtedly was the wisest investment, that the museum has ever made. So, it's really amazing to consider how long those temporary, $40,000 materials had lasted - they served the museum's visitors well and faithfully, for half a century. The museum reopened The Heart, now known as The Giant Heart: A Healthy Interactive Experience, to great fanfare on October 1, 2004. (It had had several name changes over the preceding decades; its original title in 1954 had been "The Engine of Life". Of course, there's a lot more to the museum than just the Heart. But that's the can't-miss exhibit, when you visit. The Science Museum is generally open every day, from 9:30 AM to 5:00 PM, except for major holidays. There are various other temporary exhibits, which have different hours. In addition, the IMAX theater has different hours for show times, so it's best to check with the museum directly, depending on what you're interested in visiting or seeing. The basic admission fee is called the Sci-Pass, which does not include admission to the IMAX Theater and/or the Franklin Theater. For the base Sci-Pass, it is $14.75 for adults, $13.75 for students/military/seniors, and $12 for children. There are additional charges, if you wish to see movies in either theater. If you wish to visit one of the blockbuster temporary exhibits, the museum offers combination tickets. It is an expensive day, particularly in light of the number of Free Places to Visit in Philadelphia. Of course, the science museum is loaded with fun things to do, and you can easily spend your entire day there, especially if you go to one of the movies. It's totally worth your admission price. And if you're going to spend so much money, you obviously want to get your full money's worth. And so, if you're going to go, we'd recommend blocking out an entire day, for the Franklin Institute. This is in marked contrast to some of the other major attractions, especially in Old City, such as the Liberty Bell or Franklin Court, which you can visit far more quickly. At those Old City attractions, you can still fully enjoy the complete, authentic experience, but they are far smaller than the science museum. Accordingly, they don't take anywhere near as long, to absorb the experience. So, in summary, factor in a whole day, if you decide to go. The Franklin Institute is nearly two centuries old, as it dates back as far as 1824. In fact, its original home was the building now known as Independence Hall! By 1824, the birthplace of the Declaration of Independence, originally the Pennsylvania State House, was then known as the Philadelphia County Court House. On February 5, 1824, Samuel Vaughan Merrick and William H. Keating founded what they named The Franklin Institute of the State of Pennsylvania for the Promotion of the Mechanic Arts. Its long, unwieldy, original name is particularly ironic, since recently, the museum somehow felt that just being known as The Franklin Institute, was too long for people to remember. It was named after Benjamin Franklin, to honor his tremendous legacy, and to promote inventions, a field in which Franklin made some of his most significant accomplishments. Soon after its birth, the Franklin Institute moved a couple of blocks away, to 7th Street between Market and Chestnut Streets - to the current home of the Atwater Kent Museum. It remained there, for about a century. So how did it wind up at its current home, 20th Street and the Parkway? The Franklin Institute, and the Poor Richard Club (a reference to Franklin's famous publication, Poor Richard's Almanack) decided to raise funds for a far more elaborate science museum. This was a particularly audacious decision, given that it was made in 1930, at the beginning of the Great Depression. In one of the most stunning fundraising feats in Philadelphia history - and possibly the most stunning - the organizers were able to attract pledges of $5.1 million - in 12 days! During the Great Depression, no less. Raising $5.1 million in 12 days in 1930, would be the equivalent of raising about $65 million in 12 days, in today's dollars. And so on New Year's Day, 1934, the new, vastly improved Franklin Institute opened to the public, at its new home. Along with the Chicago Museum of Science and Industry, which also opened in phases during the 1930s, the Franklin Institute can legitimately claim to be one of the first two hands-on science museums in the nation. Adding to its prestige in the field of scientific invention, two of the most historically important inventors demonstrated their work at the Franklin Institute. In 1893, while it was still located on 7th Street, the great Nikola Tesla illustrated the concept of wireless telegraphy, a major advance in communications. Over four decades later, on August 25, 1934 - less than eight months, after the museum opened its doors, at the new 20th and the Parkway location - Philo T. Farnsworth displayed his all-electronic television to the public. As it grew in popularity, further expansion came. In May 1990, an IMAX theater, along with other interactive exhibits, first opened its doors, further enhancing the overall offerings of the museum. The Franklin Institute (Fortunately, For Only A Year) Becomes "The Franklin"
The Franklin Institute continued to thrive into the 21st century. But for about a year or so, for reasons which remain murky, it opted to rebrand itself as simply The Franklin, presumably as a way of keeping up with the increasing trend, of shorter names for institutions. We found this puzzling at the time of the change, mainly because of the Franklin Institute's prestige and status, among generations of Philadelphians. The name was - and is - a great brand, to use the trendy term. What point would there be in changing it? And even if it were to be changed - the phrase The Franklin, unadorned by other words, invited confusion, from residents and visitors alike. Fortunately, in June 2009, the Franklin decided to abandon the idea of its new, truncated name, and quietly resumed its traditional identity, as The Franklin Institute. Even though for a year, the Franklin Institute had (officially, at least) a shorter name, it always continued to have a "big heart", both literally and figuratively - and it always will. The giant heart replica, through which visitors can walk through the human heart, in the same way blood flows through it, remains an iconic experience for all Philadelphians. And in spite of the (fortunately, temporary) name change, the Franklin Institute remains what it always has been: a fantastic science museum, named after the revered, illustrious Philadelphian - who was a great scientist, long prior to becoming a great statesman and Founding Father. When in season, the purple Phlash Trolley has a stop at the Franklin Institute, and is the best way there. However, the Phlash only operates from May 1 to October 31, and ceases operations for the day at around 5:30 PM - 6:00 PM, depending on circumstances. SEPTA also provides plenty of ways to get there. You can take the Blue Line - which is also known more formally as the Market-Frankford Line, and less formally as "the el" - short for "the elevated train - to its 15th Street Station, which permits you to exit at the intersection of 15th and Market Streets. From there, just walk up the Benjamin Franklin Parkway until you reach Logan Circle - also known as Logan Square. The Franklin Institute is at 20th and the Benjamin Franklin Parkway, along Logan Circle. You can take the SEPTA Broad Street Subway - also known as the Broad Street Line or the Orange Line - there. You can get off at either its Race/Vine stop, or its City Hall stop. The Race/Vine stop will let you off on Broad Street, between Race and Vine Streets. Follow signs for Race Street, west (i.e., the numbered streets go up, 15th, 16th, etc.) until you run into the Ben Franklin Parkway. Make a right on the Parkway and continue to Logan Circle. The City Hall stop (one stop beneath Race/Vine) will let you off at Broad and Market Streets, where the Benjamin Franklin Parkway ends. Just walk up the Parkway, or catch the Phlash, which has a stop there. The walk's not that far, though, particularly if it's a nice day. SEPTA Regional Rail also offers easy and convenient service to the Franklin Institute. Nearly every inbound train will stop at Suburban Station - which is located at the intersection of 16th Street and John F. Kennedy Boulevard. When you come up from the platform, look for signs for "17th Street". From Suburban Station, it's a short walk up the Ben Franklin Parkway, to Logan Circle and the Franklin Institute. From Suburban, you can take the Phlash, but from there it wouldn't be worth it, because it's only a short walk. 1) Your Amtrak ticket is valid on the same day, for a free ride to and from Suburban Station (as well as Market East Station - over at 11th and Market Streets). When you get off Amtrak, just follow signs for SEPTA Regional Rail. When you arrive at the SEPTA area, ask to be directed to a platform with a train heading eastbound to Suburban Station. You should have no trouble, but before you get on the SEPTA train, double-check with the conductor - "Does this train go to Suburban Station?" If so, hop on - it will be just one stop, about a five-minute ride, to Suburban Station, and just follow the directions above. 2) You can take a cab from 30th Street over to the Franklin Institute, as it's not that far away. This will be much faster than taking the SEPTA train over to Suburban Station, because you can easily get a cab outside at 30th Street and leave immediately, and go directly to the Franklin Institute (whereas if you get off at Suburban, you still have to make it up the Ben Franklin Parkway, a few blocks up). So if you're pressed for time, take the cab, once you get off the Amtrak train. If you'd like to return to the Ben Franklin Parkway, please click here. If you'd like to return to the Home Page of Enjoying Philadelphia, click here.